Up from Inverness, through sunshine yellow gorse bushes we wound our way, legs feeling suddenly apprehensive! We undulated along the ridge, a gently snaking ribbon of single track taking us through the trees and open moorland. A little path promised a café and cake. Lots of cake. And probably more coffee than was wise. Rolling through the woods again, an absolute hoot of a descent brought us to Drumnadrochit. Here we paid the price for that downhill, as we encountered one of the most profanely named sections of the route. At this point, the heavens opened, so condensing our suffering into the same timeframe. At the top, the sun reappeared, and we celebrated with a wee dram. Another stretch of trail followed, but after this, we decided time was against us and we’d forego the remaining off-road section in favour of a quick spin along the main road. Our ride didn’t feel any the worse for the detour, with Loch Ness illuminated by golden evening light. 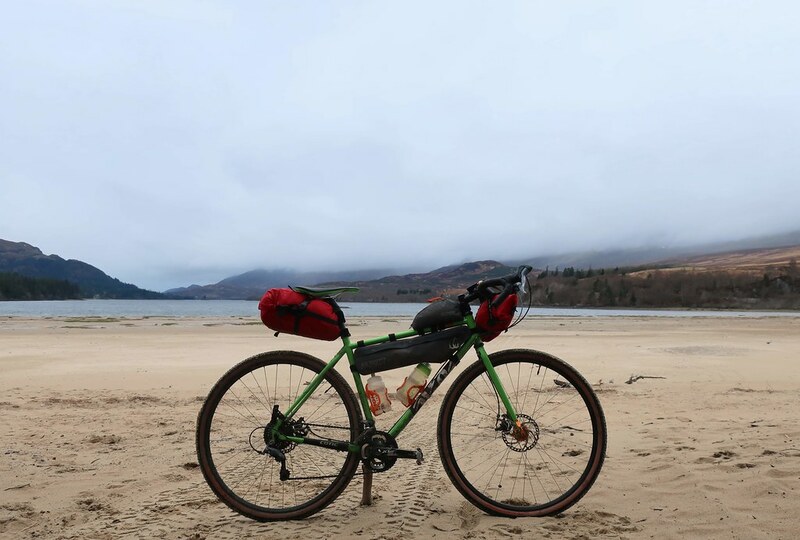 We reached our hostel as the light faded, along with all food service in Fort Augustus, so we consoled ourselves with a couple of beers before some rather the worse for wear pork pies and a late night mapping session. Up we went, over gravel and rocks, through fords, up, up, up… It got steeper. Rougher. Colder and windier. I found myself alternating between grovelling at the pedals, resting, and shouting motivation at myself. We reached a cloud-shrouded summit, and relished the prospect of a well-earned downhill. But Bloomin’ Nora! This descent needed to be worked for too! Rocks the size of jacket potatoes, vertiginous drainage bars, wheel-swallowing ruts, and even having to pedal downhill against the wind (a meteorological affront)! Eventually the rocks subsided, and we tackled the remaining drainage bars to reach Melgarve Bothy. Bothies can be lifesavers, and while it would be melodramatic to say this was one of those times, a moment of shelter and the opportunity to dry out in front of a fire was a godsend. Hot coffees were slurped, couscous was wolfed down. A toast raised to the conquerors of the pass! Renewed, reinvigorated, and distinctly drier and warmer, we set off on a smoother road, startling a herd of red deer. Further on, we repeated the trick on some fallow deer, before continuing on our way to Loch Laggan. After this, the path turned upwards again, and we slogged into a brutal headwind past Lochan na Hearba. From here on in, the wind would not abate. Through woods and into Strath Ossian. The hills here among the biggest of the trip, their summits towering half a kilometre above us. This section was humbling stuff, a reminder that this is big country and you really can’t take it for granted. Corrour shooting lodge (almost certainly a Bond villain’s lair) appeared, and the end was in reach. 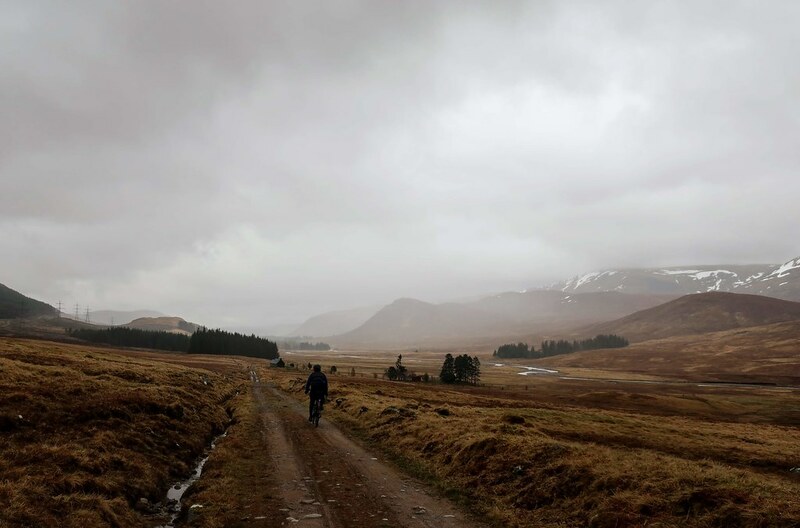 Mist covered Loch Ossian, but slowly shapes became distinct; trees, a hut, the hostel! We must have looked like death when we arrived. We checked in, gave up on any ideas of dressing for dinner, and scooted up to Corrour Station for our dinner. The last mile was covered at a much more sprightly and happy pace in the knowledge that warmth and beer awaited. The first one barely touched the sides, and we wolfed down immense portions of local venison before heading back to the youth hostel. Hot showers, dry clothes, and a nightcap ensured a good night’s sleep, despite the snores of one of our fellow sleepers. A gentle start to the morning; Tom fixed porridge, I brewed coffee and we enjoyed the stillness of the loch. Bikes were repacked, and we headed upwards again, into the low cloud. Eventually, the track levelled out a bit, and as it headed downwards, the sun threatened to break through. A brief spin along the road to Bridge of Gaur, then off-road again, across the moors and into Rannoch Forest where we paused for lunch (more couscous), and rehydration (more whisky). 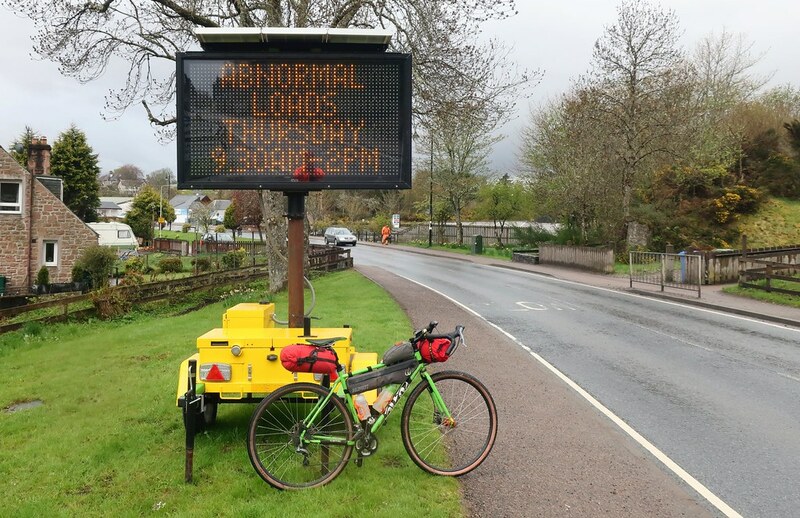 We continued south along the old Kirk Road, which turned into yet another grinning-from-ear-to-ear descent, only interrupted when we stopped to chat to another biker heading north, and asked where he was headed. “Cape Wrath!” came the reply. Blimey. This brought us to Glen Lyon, which proclaims itself the longest, loneliest and loveliest glen in Scotland. I’ve not visited enough glens to confirm the superlatives, but it’s surely up there. Having seen the hills to our south, I harboured a certain degree of apprehension as to our route to dinner, but as we gradually made our way to the head of the glen, we gained enough altitude to make the final ascent rather better than I’d anticipated. Down the other side, and along the road into Killin. 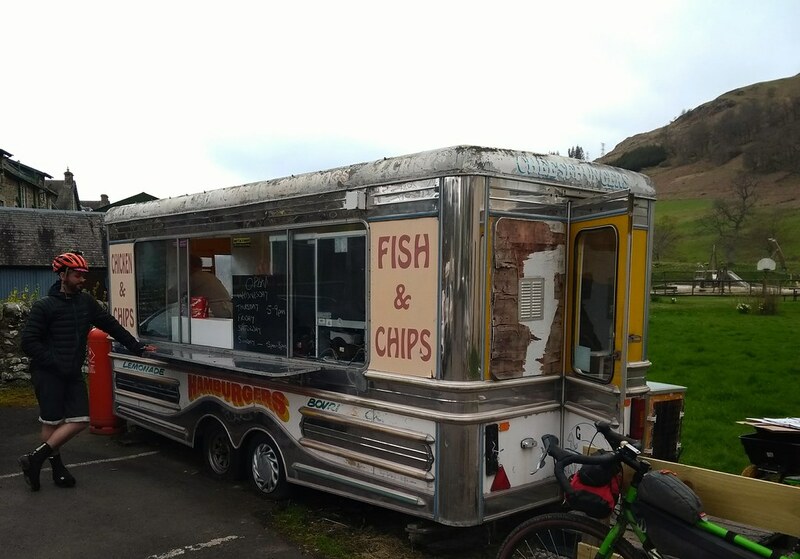 Here, we tucked into fresh fish and chips, served from a somewhat dilapidated caravan; top chips nonetheless. From here, over the picture postcard Falls of Dochart and up the last ascent of the day, a strenuous yet satisfying wooded single track, before fire road and then dismantled railway dropped us down into Lochearnhead. This was the morning we bid farewell to the Badger Divide, opting instead to head east towards Chez Tom. But first, breakfast! The bunkhouse hobs were covered with frying pans, filled with bacon, sausages, and Lorne slice. Heaven. Except this sumptuous spread belonged to the other guests, and we were on porridge again. Balls. Back on the road, and a gently undulating road along the south side of Loch Earn. Beautiful woodland gave way to myriad campers, making the most of Scotland’s open approach to land access, followed by a “leisure park”, chock-full of static caravans. After so long in the wild, this stuck in my throat rather, but each to their own I guess… Second breakfast was sourced at St Fillan’s café, bacon rolls making up for our earlier torture at the bunkhouse. 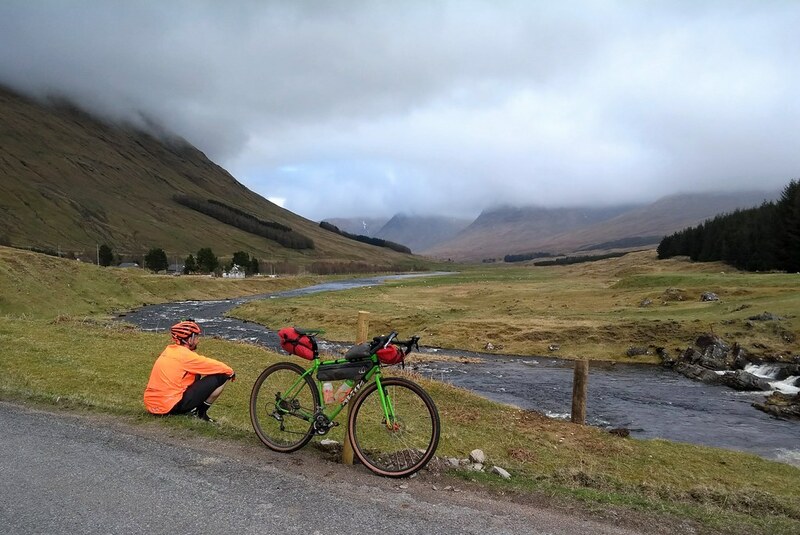 We meandered down the River Earn, then back onto tarmac for the last stretch of flat before the final push over the Ochils. We found ourselves headed up a delightful little wooded glen and out onto the open moors. Here, the path disappeared and we pushed over the ridgeline, direction finding reduced to educated guessing. Eventually a path materialised, then a gate, and then a rather entertaining slither down the hill and nearly through a gorse bush. The final turn took us onto a familiar trail, where we hit all the kickers, hopped rocks and a dead sheep, and rolled into Tom’s driveway, exhilarated, happy and spent. Well done to Chris & Tom for completing the epic ride!